You know that Quick and Easy French Bread I made the other day? Well, that recipe made a lot. I mean two HUGE loaves. So it was guaranteed that there was going to be a lot leftover between two people and one toddler. 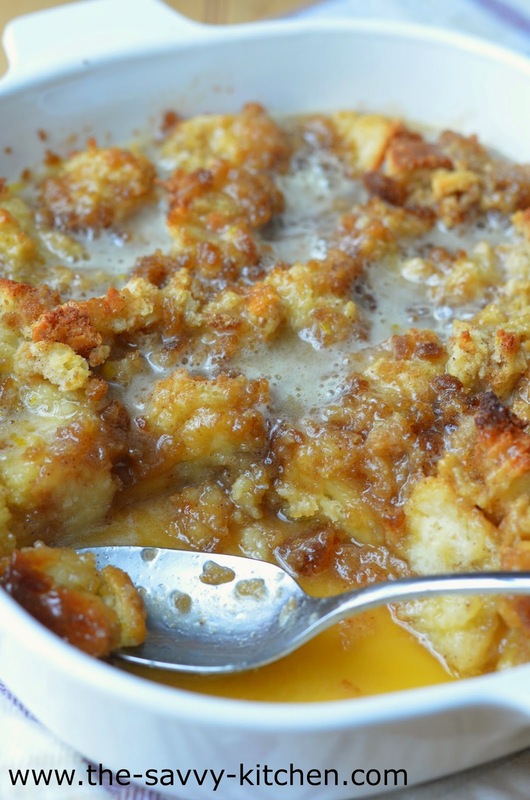 Of course I wasn't going to let it go to waste, so I made this a-MAHH-zing bread pudding. And I mean amazinggggg. You've gotta try it. 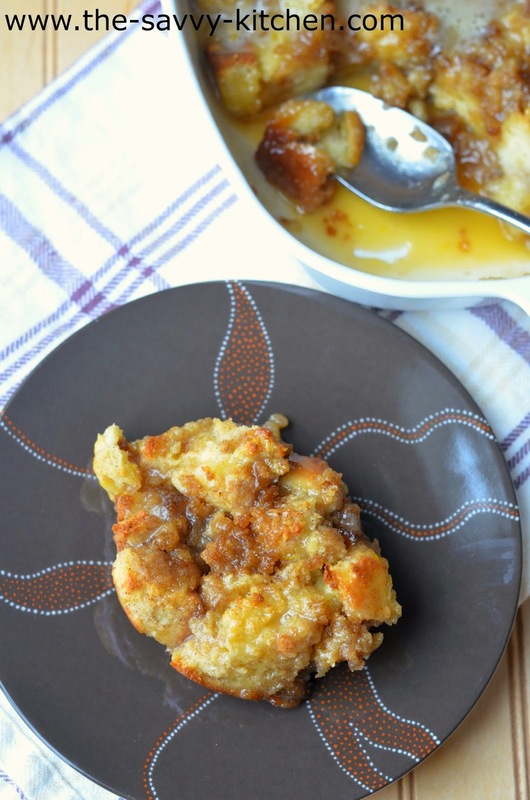 The bread pudding alone is really great. Bread, cinnamon and sugar? C'mon. But then I added a glorious brown sugar topping. And to make it EVEN better? A thick sauce made of butter, sugar and vanilla to top it off. Did I mention this isn't a low-calorie treat? It's not, but I gladly devoured a few extra calories for this bread pudding. It was off-the-charts good. Enjoy! Heat oven to 350 degrees F. Grease a 13x9-inch pan and set aside. In a microwave-safe bowl, add milk and 1/4 cup butter. Heat for 1-2 minutes, or until butter is melted. In large bowl, mix eggs, sugar, cinnamon and salt. Stir in bread cubes. Stir in milk mixture. Topping: In a small bowl, add brown sugar and 1/4 cup softened butter. Combine using your fingers. Sprinkle evenly over the top of the bread mixture. Bake uncovered 40 to 45 minutes or until knife inserted 1 inch from edge comes out clean. Sauce: Meanwhile, add butter, sugar, egg and vanilla to a small saucepan. Cook over medium heat until butter is melted and ingredients are combined. 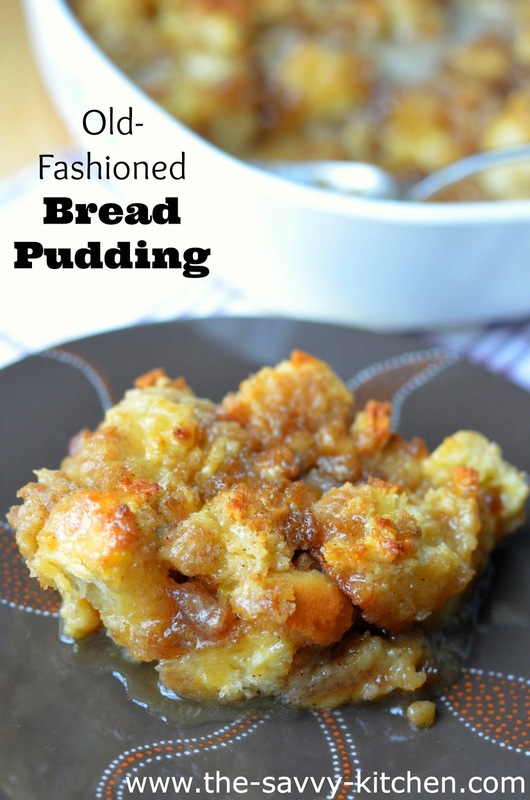 Pour over cooked bread pudding. Serve immediately.